Widen local understanding of issues affecting the Armed Forces Community. The government has put in place a national Armed Forces Covenant which looks at the relationship between the government, the nation and the armed forces, and is supported in law by the provisions of the Armed Forces Act 2011. At local level this national covenant is given strength through local authorities, business communities and other civilian sectors through entry into local community covenants. The core principle behind the covenant is that members of the armed forces do not suffer any disadvantage by virtue of their service. Further information in relation to both the Armed Forces Covenant and Local Community Covenants can be found here. The Community Covenant is entered into by various cross sections of the community including representatives of the local authority and the armed forces. 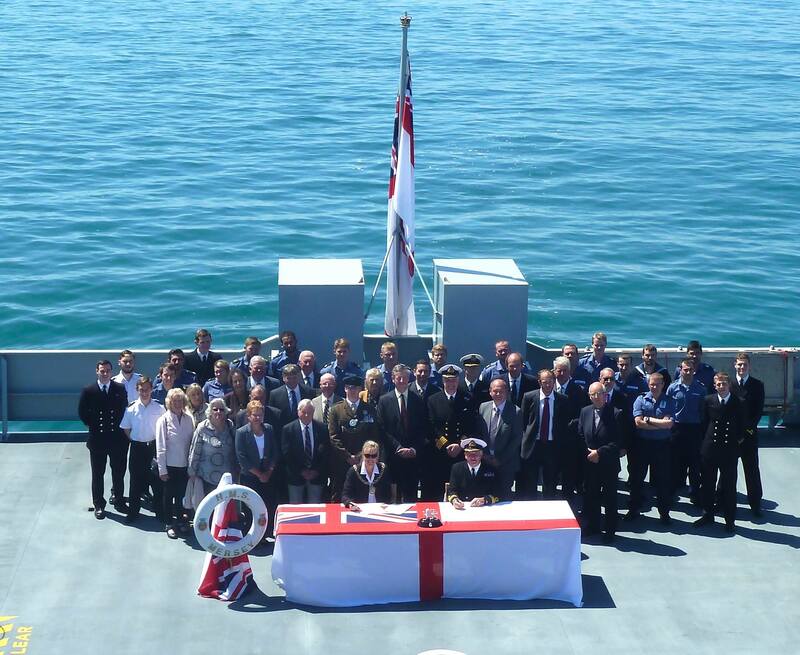 On the 15th July 2014, during a ceremony aboard HMS Mersey (above), the Council of the Isles of Scilly together with members of the voluntary and business community entered into a Community Covenant for the Isles of Scilly with the armed forces. A copy of the Covenant can be found here. As part of the commitment to assist the relationship between civilian and armed forces communities, the government has set up a Community Covenant Grant Scheme to fund local projects that support this aim. There can be no ongoing costs covered by the grant. Applications can come from any part of the Community, for example charities, commercial organisations, community groups, schools, health service providers and local authorities. Full guidance with regards to the Community Grant Scheme together with an application form can be found here. Any completed application should first be submitted to theo.leijser@scilly.gov.uk.